Custom build guitars & repairs in Amsterdam. Custom CTS potmeters are now available. Regular standard CTS potmeters are very common used in electric (bass) guitars, and they work just fine, but some people who has used them might have noticed a variation in resistance value and taper curve. A standard CTS potmeter have a big variation of +/- 20% in the real resistor value as you measure a few potmeters of the same listed value. The new custom CTS potmeters have only a +/- 9% variation. The real value is more close to the listed value. 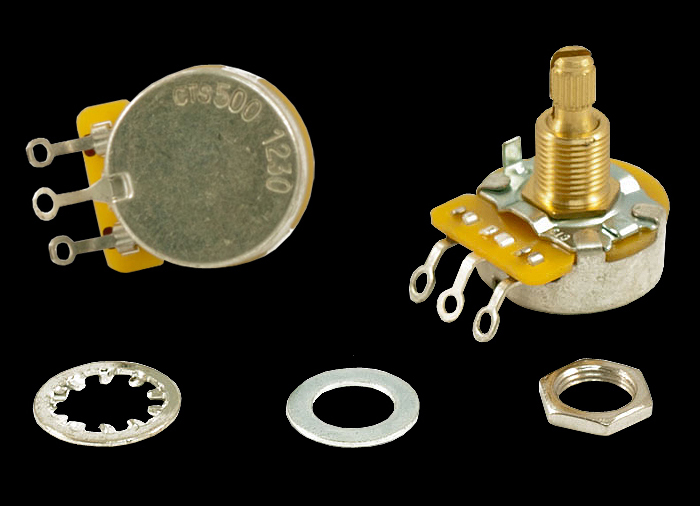 The custom CTS potmeters also never get a lower resistance than 250k or 500k, and have a custom taper curve that is suitable for both volume and tone control. What value should you choose? A potmeter, when turned at volume 100% will cut off a little bit of treble from the sound. If you connect the pickup straight (without a potmeter) to the output, it will sound a little more bright. The lower the value of the potmeter, the more the treble cutoff will be. A 250k potmeter will cut off more treble than a 500k potmeter. In general, a 500k potmeter is used with a humbucker and P90 pickup, and a 250k potmeter with a Fender style single coil pickup and most bass guitars. There is no hard rule, a Jazzmaster has 1M (1000k) potmeters in the lower sound controls. Many strats with a humbucker bridge pickup have still a 250k potmeter. When your pickup sounds a touch too bright, you could try to change the potmeter to a 250k value. When the pickup sounds muddy and dull you could try to replace the potmeter by 500k value. Fern’s Custom Orville Breeveld signature electric guitar on the website! Like Fern’s Guitars on Facebook!